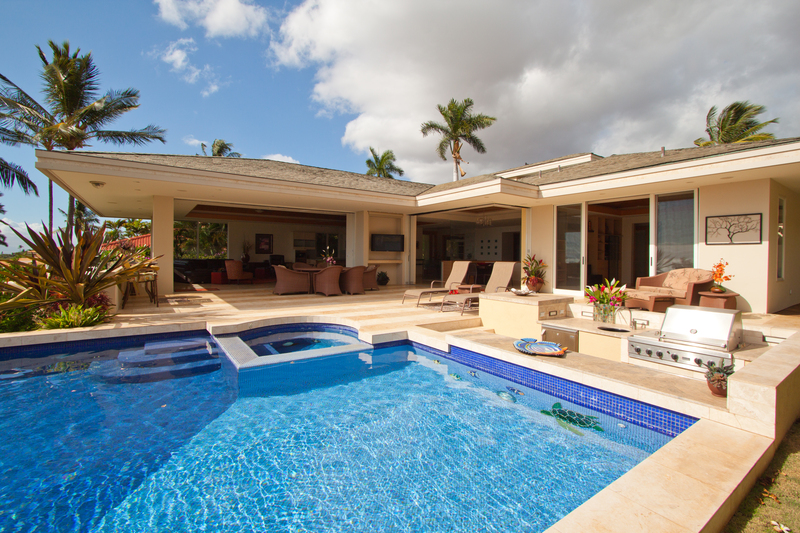 On July 6th we saw a 4 bedroom home on 1.69 acres of exquisite oceanfront located at 7150 Makena Rd. close for $27 million. This brings to mind the old real estate adage of “Location, location, location!” Oceanfront property of this caliber exemplifies the ulitmate in Lifestyle living here in South Maui. And if you have the means, the opportunities do exist. If this is the lifestyle you seek, consider another oceanfront property currently up for sale in the Black Sands subdivision, a gated community consisting of only 7 homes in Makena. It has 4 bedrooms & 4 baths with 5400 sq. ft. of living area, and features “sweet life” extras like a trellised pool cabana that seats 12 and an 800 bottle climate controlled wine room. Being offered at $19.5 M it’s a steal compared to the recent sale right up the street! Whether you’re interested or just curious…check it out by clicking HERE to take you to the listing on the Maui MLS. The other big sale was for $5.1 M cash for a home in the exclusive gated community of Wailea Golf Estates. This 4 bedroom villa offers privacy, panoramic golf course and oceanviews, and year round sunsets from every room in the house! With pocketing sliding doors & shades, the new owners will really be able to enjoy the indoor/outdoor lifestyle! If that one sounds nice check out my listing right down the street, a contemporary custom built executive home offering very similar views and amenities as the one recently sold. This home is featured in the August issue of Luxury Home Magazine (see page 40 for the editorial) for its pool deck lanai featuring a sunken kitchen with Viking BBQ and Flat Screen TV for the multi-tasker who wants to soak in the hot tub, grill, and watch the game & sunset all at the same time! This home features a clean, contemporary design with special touches throughout – a media room with projection screen & full surround sound, a wine cellar, 2 oceanview guest suites, a gigantic soaking jacuzzi and serene indoor/outdoor Japanese style shower for the ultimate tropical experience to name just a few. To see the Virtual Tour CLICK HERE. No matter what you are looking for in South Maui Real Estate, there are some great buys out there right now and the market is moving. I know this market, and if you’re interested in buying call me, I can help you find your dream home! Wouldn’t you like to be living the Maui Lifestyle?